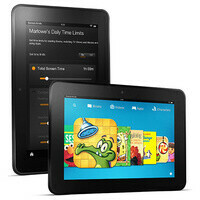 Amazon's 8.9-inch Kindle Fire HD tablet is already pretty affordable, retailing for $299 in its cheapest form. However, what if we told you that you can buy it for even less by entering a special discount code at checkout? Well, here's how that happens: the magic word is "FIREHD89" and it is good until the end of the day only, or while the Kindle Fire HD 8.9 supplies last, whichever comes first. The promo code gets you a discount of $50, meaning that an Amazon Kindle Fire HD 8.9 can be purchased for as little as $250. And when you think about it, that isn't too bad of a price for a 8.9-inch Android tablet that comes with a 1920 by 1200 pixel display for crisp graphics and 16GB of storage for all your stuff. You just have to keep in mind that the Google Play store is not accessible. Instead, content can be downloaded from Amazon's digital storefront. 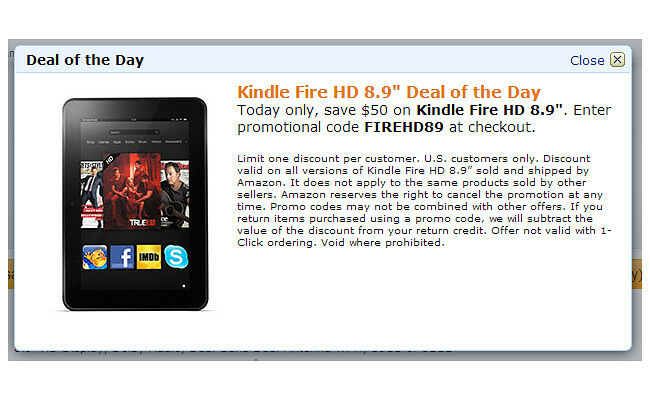 So there you have it: Amazon's deal of the day is a Kindle Fire HD with an 8.9-inch high resolution screen, yours for $250, or for $450 in case you absolutely must have LTE connectivity. Check out the deal by following the source link below! I might get one right now for family they don't care about the Google play store.